When asked the seminal question, “If you could meet any person from the past and talk with them, who would it be?” many people would automatically think of their favourite celebrity, scientist, politician, or historical figure who lived prominently in the view of the public and whose lives were well documented by historians and biographers. For me however, my individual instead would be my great uncle, Private Clayton Donald Morningstar. Growing up, my knowledge of my great uncle was uncertain at best. My grandfather, Howard Morningstar, Clayton’s younger brother, seldom mentioned his brother. I grew up with the knowledge that he served and was killed in Korea, with no further details regarding his life. Growing up, I used to believe that Clayton was buried at his (memorial) gravesite in the Fairview Cemetery in Niagara Falls, Ontario. Years later, I was watching a History Channel documentary with my father on the Korean War, titled In Korea with Norm Christie. The episode that we were viewing came to a segment where Norm Christie was walking through the United Nations Cemetery in Busan, South Korea with a Korean War veteran named Terry Meagher. They came across several grave plots where members of the 3rd Battalion Royal Canadian Regiment were buried, and what caught me by surprise was seeing the name of my great uncle Clayton Morningstar on a gravestone in that cemetery. This was accompanied by Mr. Meagher talking about his memories of my great uncle, and my curiosity took off. From that point on, I wanted to gather as much information on this reportedly brave man as I could to try and understand a significant -component of my family history. This brings me to the purpose of my writing: to bring to light a fuller understanding of the man I never knew, Private Clayton Morningstar. Clayton Morningstar was born on May 13th, 1930 to Clayton Morningstar (Sr.) and Mildred Florence Morningstar in Niagara Falls, Ontario, Canada. Clayton was the oldest child of Clayton Sr. and Mildred Morningstar, and had 8 other siblings: Douglas, Howard, George, Gordon, Kenneth, Phyllis, Catharine and Nancy Mae. Growing up in his family household on Crysler Avenue in downtown Niagara Falls, Clayton Jr. went by the nickname Donny according to friends and family. Clayton Morningstar was an average height and well-built male, and was unusually mature for a 20 year old. This showing of maturity was amplified when he joined the 3rd Battalion of the Royal Canadian Regiment on December 3rd, 1951. This was a moment of great pride for the Morningstar family, but meant only one thing: the eldest Morningstar child will be going to Korea as part of the United Nations Task Force attempting to keep the Communist North Koreans and their allies from controlling all of the Korean Peninsula. In Korea, Clayton was dispatched along with the 3rd RCR to Hill 355 (so named because of its elevation above sea level: 355 metres), which was also known as “Little Gibraltar”. 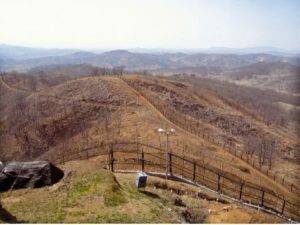 Hill 355 is only 40km north of Seoul, the capital of South Korea, and by October of 1952 was a hotbed of activity and a location of utmost strategic importance to the United Nations ground forces. The enemy forces had been harrying the United Nations forces on Hill 355 (primarily composed of companies of the Royal Canadian Regiment, with support from the Royal 22er Regiment on the adjoining Hill 227) for quite some time. 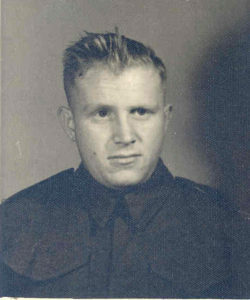 Clayton Morningstar was reported by former unit member Terry Meagher to have been present at Hill 355 during these exploratory raids launched by Chinese and North Korean soldiers, where he gathered some of his earliest experiences of combat during the Korean War. 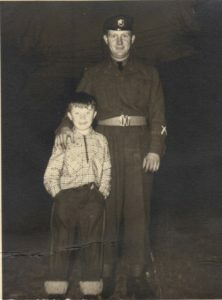 Months later, this time in April and May of 1953, Clayton and his unit of the 3rd RCR were moved to Royal Canadian Regiment lines (specifically the Jamestown line) at Hill 187. Hill 187 was positioned along the Samichon River, just east of Kaesong (where the UN peace treaty was being ratified at the time) along the North and South Korean border, At Hill 187, the 3rd RCR was tasked with patrolling the valley in between the Canadian lines on Hill 187 and the Chinese lines opposite. Clayton Morningstar’s company was rather new, as was the 3rd Battalion as a whole unit, so when the Chinese launched an all-out assault on the Canadian trenches, they were scrambling to adapt to the situation. 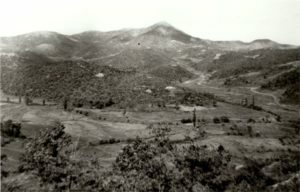 The Chinese bombardment began around 9:30pm on May 2, 1953, when Chinese force of about 400 men massed to take C Company of the RCR’s section of Hill 187. The Chinese artillery were targeting the area in front of the assault troops’ positions in a creeping barrage format, allowing the Chinese to storm the C Company’s lines. In the defence of C Company trenches, Clayton Morningstar was shot and wounded 5 times, but held his position not wanting to retreat and concede ground to the enemy. 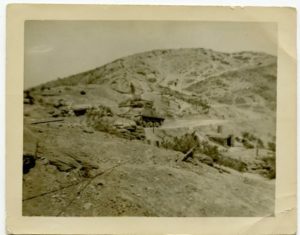 Despite the overwhelming artillery barrage and attack by the Chinese that night, the Canadians were able to hold their lines at Hill 187, and Clayton Morningstar was evacuated in the middle of the night via helicopter to a nearby MASH (Mobile Army Surgical Hospital) unit, where he was operated on. Clayton was only able to survive for a few days however, and passed away due to his injuries sustained in combat on May 10th, 1953. If he had survived only three days more, he would have lived to see his 23rd birthday. 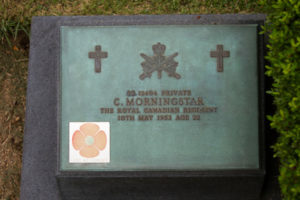 Clayton Morningstar was interred at the United Nations Memorial Cemetery in Busan, South Korea instead of being shipped home to be with his family. This was devastating to his family, who were unable to bury their brother/son in his hometown. It was hard (and still is for some) for the family to find closure all these years after his death. I never met this man, but growing up and hearing stories of his life and what he went through to selflessly help a nation of people on the opposite side of the world maintain their freedom, I long to have known him. Because of what he did in the name of international peace, I take great honour and pride when I say that Clayton Morningstar was a Canadian hero, a personal idol, and most importantly, family. Rest in Peace Private Clayton Donald Morningstar. Our student blog series is written by our summer students funded through Young Canada Works. During this series we ask our students to research and write on a relevant topic that interests them about Niagara’s military history.